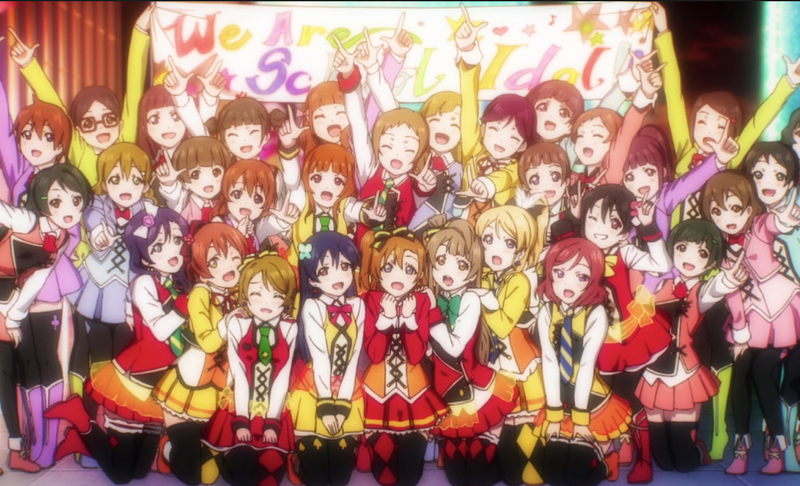 If you were to ask me what I thought about Love Live as a franchise, I would say that I acknowledge its existence. It’s one of the biggest anime properties out there right now, as well as the biggest idol anime in existence in terms of public profile, marketing, cosplay, and cover groups by said cosplayers. 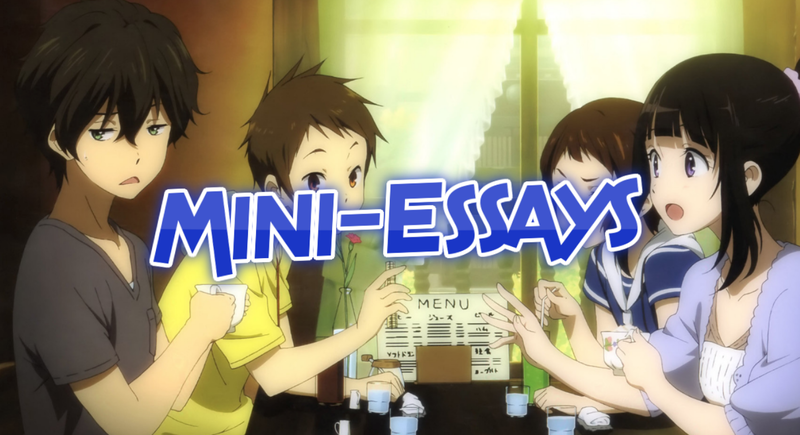 At the time of this writing, the series has had two seasons and the film we’re going to be reviewing right now, along with a spin-off called Love Live Sunshine that is also two seasons long and whose film just came out a few weeks ago. And man, did I underestimate how big this thing would be when it first premiered in Winter 2013. Then again, I underestimated a lot of things back then. But yeah, I have no real affection for Love Live as a series. It’s not like I hate it though, because the characters are kind of fun even if they conform to stereotype a little too much. 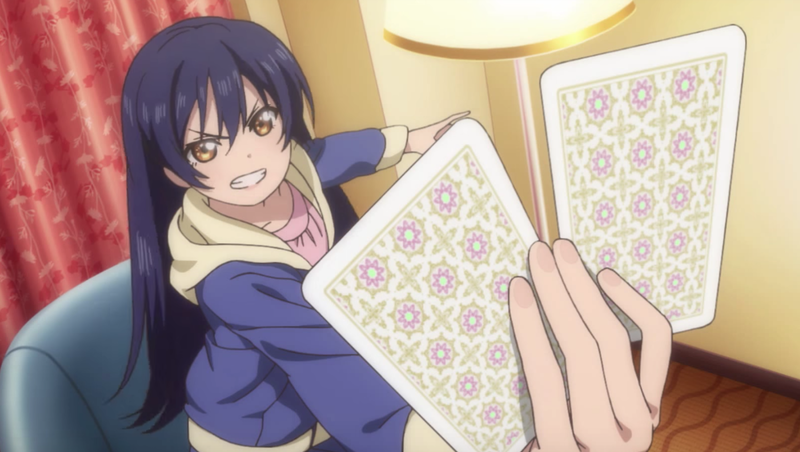 I like Umi’s strictness combined with her girly nature. I like Nico’s two-faced nature as well as the Nico Nico Nii meme. I…actually I don’t remember what Kotori contributes. 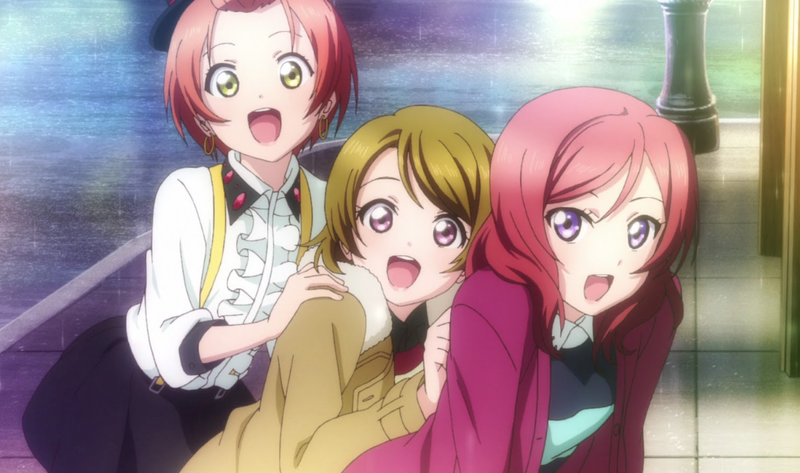 Maki seems to be the most popular of the girls according to MAL and yeah she’s cool. But while the show itself can be entertaining at points, the overall story that’s given to these girls is just not that compelling to me. A school is closing down, so we need to gather these nine schoolgirls to save it with CGI performances? Not really feeling the tension there, especially since other schools exist and they don’t really clarify what’s particularly great about the school these girls attend. It really just feels like an excuse to have these characters get together and sing songs that quite frankly aren’t my thing. I can’t really remember any of them no matter how many times I listen to “Snow Halation”. On the other hand, I can remember the Nico Nico Nii ~ Beatstep Remix pretty easily. It just never leaves my freaking head. Gah! Having said all of that, I was looking forward to seeing how the movie was like after my recent watch of the series ended on a cliffhanger that showed Mu’s (the idol group the main characters belong to, but let’s be honest, who reading this review doesn’t know that by now?) wasn’t breaking up yet, purely because I was curious what an idol series would be like in the feature-length film format. Would it just be fanservice or do we actually get a conclusion that’s high-stakes enough without changing the core of Love Live? Despite all of my problems with the series, it’s not like I want the film to become Perfect Blue or anything of the sort. I just wanted the movie to surprise me and…well read on to find out. 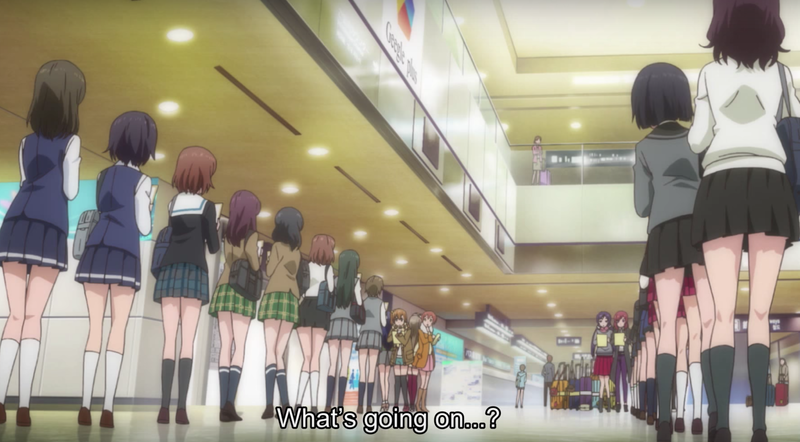 Love Live: The Movie starts from the cliffhanger ending of the second season where the senpais are about to graduate (because that’s how all competition anime end, don’t they?) and part from Love Live forever, but a surprise phone call offers them a chance to hold one more competition at the Tokyo Dome, and naturally the girls want to postpone their goodbyes as long as possible. The plot of the movie basically consists of them going to America in order to do a concert that will make them more popular before they do the actual competition in Japan, and during this journey, they learn more about how much being an idol means to them whilst struggling regarding whether they really want to split after this final competition is over. It’s a pretty fitting story for the grand finale in abstract, if I do say so myself. When you’re given a chance to continue for a while longer, how will the characters react and grow when said chance is taken? The movie basically consists of two halves: the half when Mu’s is in America and the half when they return to Japan. Let’s start with the American one first because that’s where the film starts and personally I think it’s the most interesting. While obviously not anywhere near as grimy and homeless-ridden as the actual New York, it’s clear that the creators of this movie went there in order to research the architecture and recreate the settings accurately so the audience can have a genuine American experience with these girls. 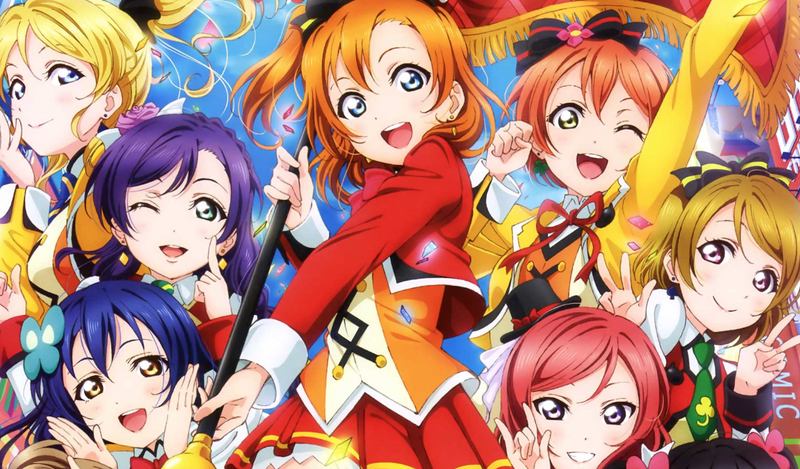 For the most part, it does feel like a tour of New York if sanitized by Love Live’s cheerfulness, but there’s enough going on so that the average anime fan is somewhat captivated. There a lot of cute jokes and amusing situations that come from the setting like how Honoka accidentally gives Rin and Umi the wrong address to their hotel so they end up at a shady one, or when literally only one of the girls can speak English in a country where everyone speaks English. Investment in the characters is required for that to work on you, which fortunately I have, and I’m assuming everyone who watches this movie will have too. 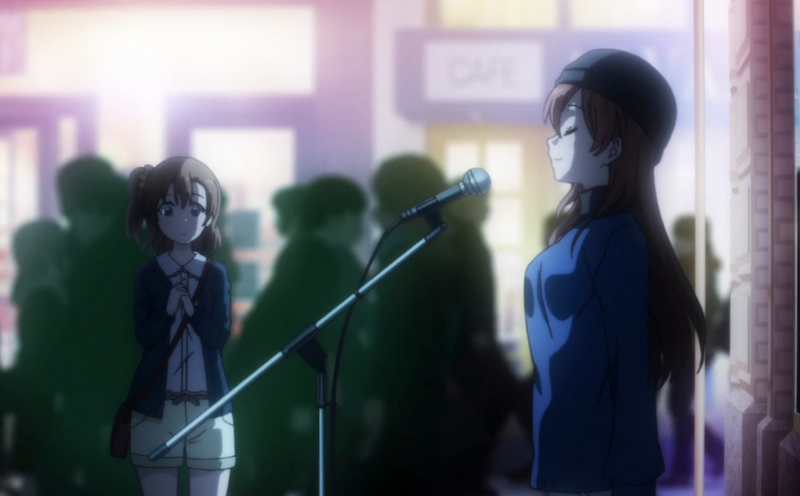 There’s also a part where Honoka gets separated from the girls and she has to find her way back with the help of a mysterious singer who can speak Japanese and questions who Honoka is singing for. Now I don’t find any one character to be really interesting beyond the personality given to them, but I’ve never found Honoka to be very interesting on that front either, so I mostly just appreciated that act for the situation she found herself in rather than how it built on her character. After that scene, the girls do their one big idol performance and fly back to Japan, only to find that they’re popular enough to the point that random folks will walk up to them asking for their autographs. There’s some discussion about how they’re too famous to walk around freely like they used to, but it doesn’t really factor into the story that much, and the rest of the movie just plays out like a typical Love Live episode except twice as long and with some obvious attempts to get old characters back whilst upping the spectacle. That’s pretty much why I find the second half of this movie to be somewhat weak: it falls into the same trap of just giving us what we know from the series only tweaked a bit that most franchise films do. Any new ideas that could be explored are just tossed aside or put in the background so that we can have some more songs for the OST. And exactly what was done to up the ante for the Tokyo performance you may ask? Mu’s gets many girls to sing with them. Because bigger is better, right? 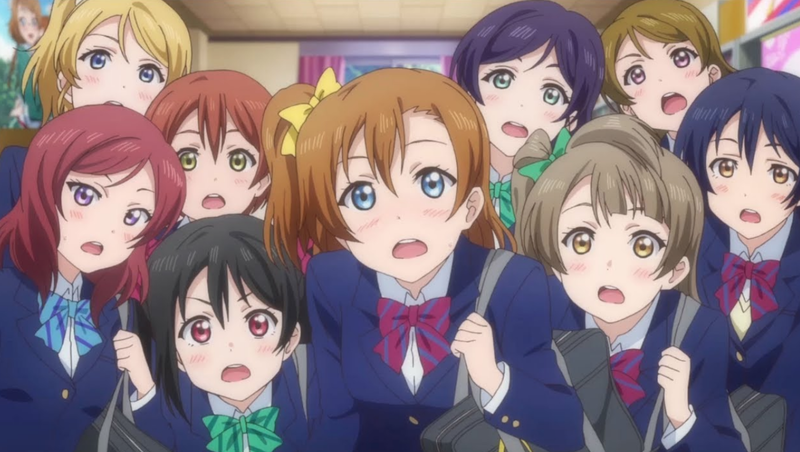 There’s some other stuff going on as well, like how we see Maki writing a final goodbye song at various points throughout the movie, the third-years contemplating whether they should really leave their friends, and Honoka’s siblings wishing to succeed her, but they all go in pretty predictable directions that aren’t really worth giving attention to in this review. I think it’s pretty clear at this point that the Love Live movie is basically everything you think an idol movie functioning as Mu’s grand finale will be and no more. At least plot-wise it is. What about technical-wise? Well I think the animation is slightly better than the TV series, although not to the point that it makes much of a difference. A lot of the dancing is still done in distracting CG and the only really notable thing I find about this movie’s look compared to the series is that Rin’s hair is less orange and more dirty brown. Cinematography is about the same as the series as well, although there’s this weird scene when the camera goes crazy like someone lost control of the right analog stick on a video game controller in order to symbolize Mu’s confusion when they’re confronted by large amounts of fans. The intention was nice I guess, but there are definitely better alternatives to showcasing that that doesn’t hurt my eyes, Love Live. 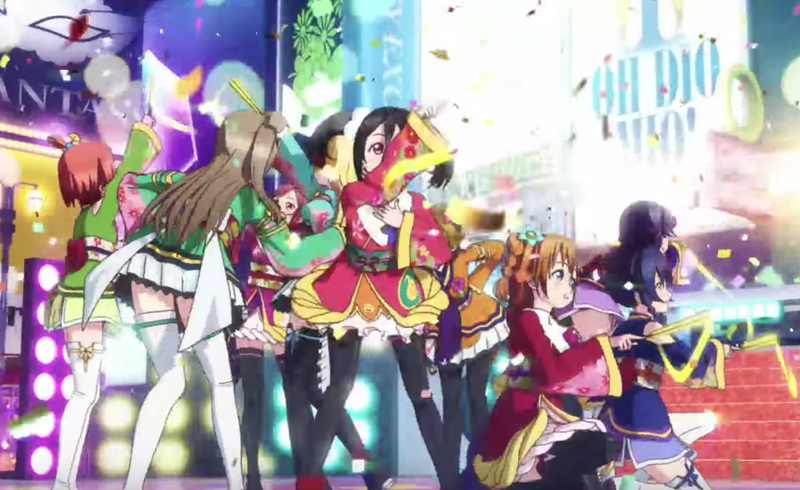 The one thing I can say is both surprising and an improvement in the film compared to the series is how it embraces a more traditional musical style for Love Live’s theatrical debut. 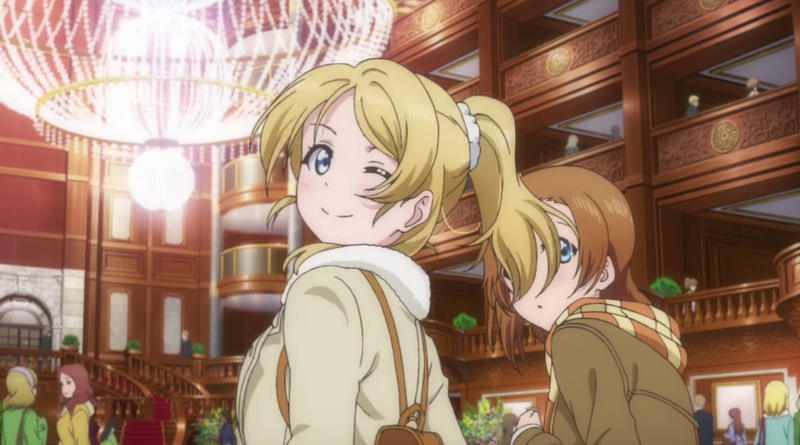 There are three points in the movie when one of the three subsections of Mu’s gets their own musical number rather than a defined idol performance, and while it can be a little out of place since they’re never used to further character or convey much story like a Disney animated film and is never brought up again afterwards, I think it fits Love Live fine. Anime musicals are very rare for a reason, so it’s nice to see the folks at Sunrise attempt it, although that obvious CG still sneaks in. Oh, and I said none of the plot elements were very surprising earlier, but I take that back somewhat. You know that mysterious singer I mentioned before? The one who helps out Honoka when she accidentally gets separated from the other characters. It’s somewhat implied that she’s actually Honoka from the future, although whether time travel was involved or Honoka was just hallucinating is something that’s not made very clear. Either way, it’s very out-of-place within the series’ own logic and I don’t really understand why the writers thought this added anything to the story, especially since she shows up only twice and stops appearing after Honoka achieves more courage. 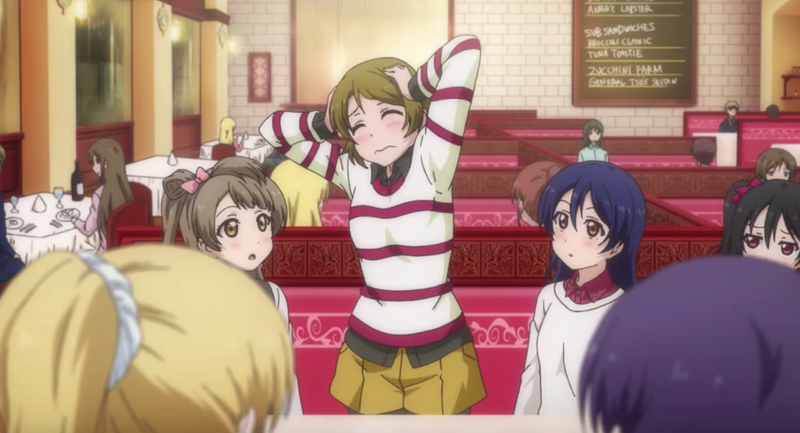 Yeah, that’s about the extent of the character growth Love Live: The Movie has to offer Mu’s leader. Remind me again why Honoka is in charge when it seems everyone around her is more responsible? 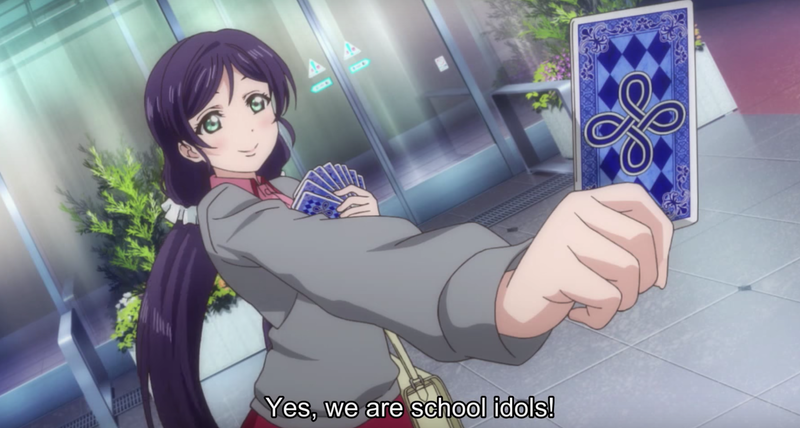 Really though, the thing that disappoints me the most about Love Live: The Movie is how it occasionally brings up interesting ideas about idols then never proceeds to do anything with them. As Zombieland Saga would later prove to me and a lot of other anime fans, it is possible to explore some of the darker parts of being an idol whilst still maintaining a cheerful attitude towards the profession (even though in real life, there’s a good bit of evidence to suggest we shouldn’t). Like I said, the increased fame to the point that Mu’s can’t walk around freely was an interesting idea. And so is the idea of trying to make a name for yourself out of your home country, like a lot of K-pop artists are doing now. It doesn’t even explore Mu’s questioning whether they want to truly part ways after having some more time in the sun all that much, because we need to devote time to Hanayo whine about needing carbs. Nice recreation of an actual restaurant Sunrise, but was it worth giving that glutton her carbs? Since this is actually a canon film serving as the grand finale for these characters before they disappear forever to the point that it’s become a meme within the community, it’s even more disappointing how Love Live: The Movie turned out. This is a movie strictly for fans of the series, and as far as I can see, there doesn’t seem to be anything wrong with it in terms of being a franchise film. And I’ll admit it wasn’t boring for the most part. But it could have been so much more than that, and apparently a lot of fans agree with me since most reviews I’ve read say this movie is not one of the highest points in Love Live. 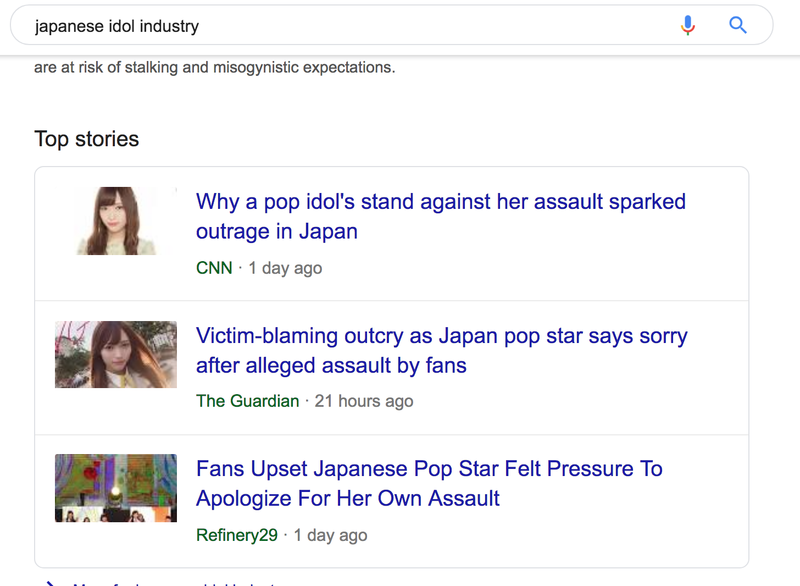 It’s a show that’s meant to make its audience happy by ignoring the harsh realities of the Japanese idol scene and giving us the surface level stuff that fans pay for. I get that. But this isn’t just a message directed towards the creators of Love Live. This is a message towards all creators looking to make a film out of a long-running franchise in general: don’t be afraid to take risks. Liz and the Blue Bird took risks to the point that it removed the series’ name from the title, and yeah it garnered some negative reception in response (although I notice they were mostly from people who didn’t like Sound Euphonium), but it’s also one of the highest rated anime on MAL, let alone rated much higher than the actual series. Yes, more people saw and liked the Hero Academia movie, but let’s be honest, Hero Academia is on top of the world right now. It had more theatrical showings than your average anime movie and would have had to been really bad to not be a success. Besides, that sort of fame fades over time whilst films like the third Madoka movie (even if discussions of it have mostly died down now) have more staying power because it took risks that may or may not have paid off depending on the individual. From what I’ve seen, those Kizumonogatari movies are still enjoying recent Internet praise due to the visual risks it took and I expect that to continue for a while, though your mileage may vary on whether it took any narrative ones. Either way, my point is that Love Live: The Movie could have joined the ranks of these other well-regarded franchise films if Sunrise had planned for it to be more than pure fun for the fans. If they had increased the animation quality. If they had developed the characters better. If they integrated the musical numbers into the plot better. If they just took advantage of the ideas they had in general. And before people say anything, yes I’m full aware this movie came out like a year after Season 2 ended (and you had to wait even longer for a stateside release). I don’t know how long it was in production exactly, but it can’t have been as long as the films I mentioned earlier, especially since Kizu was being worked on for almost a decade. But while that explains the production quality, it doesn’t really explain the writing choices. I mean who’s talking about this movie now? Yes every idol fan I’m seeing has already locked their sights on the Sunshine film, but how much were they talking about Love Live: The Movie before that? Also, how many of them paid for a physical copy of the film like I have? I’m not even a fan of this franchise and yet I spent more than thirty dollars for this review. Hope you guys are happy with the results. I promised to do more reviews of anime movies this year and Love Live was the sacred cow I chose to slaughter in order to open that gateway. Probably shouldn’t have been surprised Love Live is very popular with girls more than guys in my area considering how in this show, Japan’s population seems to be 98% female. There’s a quote from Teen Titans where Ron Perlman’s character says “trust is easy to destroy but takes time to build”. That’s pretty my reaction to the recent ANN-related drama in general. I can kind of remember the Angelic Angel song, but only because I had to loop the trailer for this movie several times to get pictures. Wonder what the Bunny Girl Senpai movie will be like? 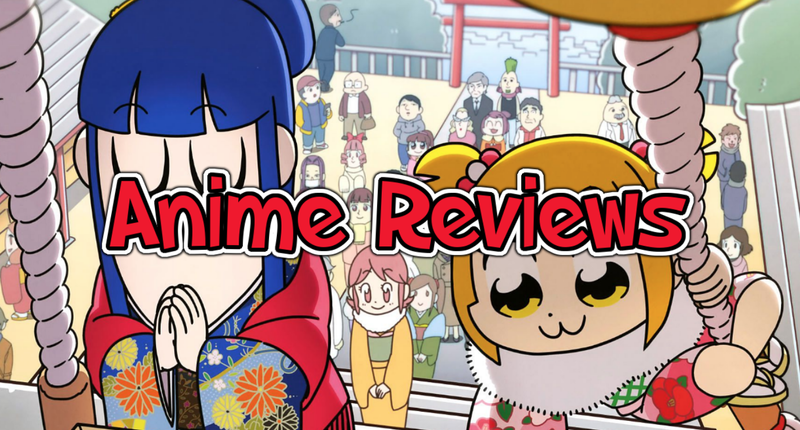 This entry was posted in Anime, Anime Movie Reviews and tagged Anime, love live, movie. Bookmark the permalink. Speaking of the AoButa movie, will you write a review on it when it comes out stateside? 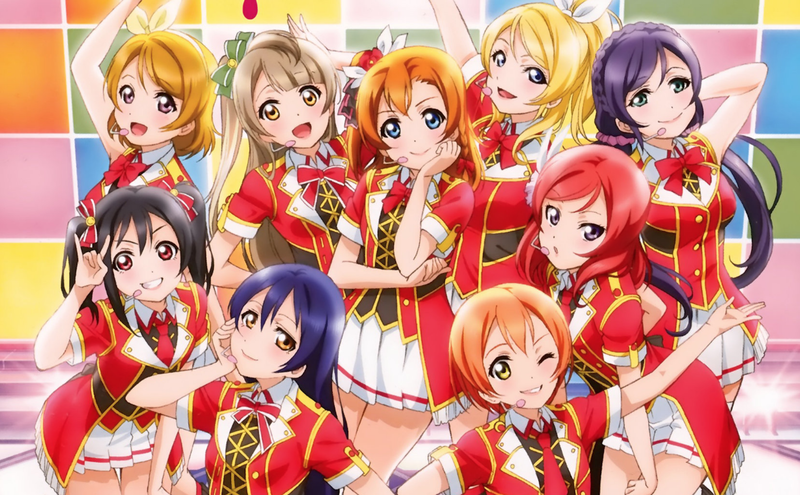 In Asia, most of Love Live’s audience is actually young males, probably between 18 and 30 years old. Yes, but in Dallas, the female audience is quite large. You see Love Live cover bands at a convention around here, you’re going to see a bunch of shrieking females yelling “best girl” when an Umi cosplayer lipsyncs to a song. Yes, in Western countries, such as America, the LL fanbase is more on the female side.